Glass blowing is a tradition that dates to the beginning of time. Throughout the ages, artists have used variations on the same heating techniques to model glass. For inspiration, Verre Minuit turns to contemporary techniques in ornamental glass working, paying particular attention to the techniques employed in the creation of one-of-a-kind pieces. The artists combine technical expertise with creative energy in order to produce pieces that are unique in form as well as in spirit. From start to finish, each piece requires the artist’s constant attention and careful monitoring. 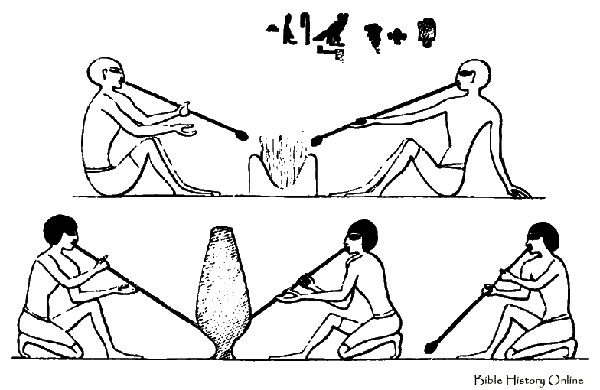 During the time of the Phoenicians, glass, which bespeaks the fascinating metamorphosis of the elements - sand, soda and limestone fused with fire at 2100°F– was discovered. The artists of today have mastered the resolutely artistic methods involving silica, lime and flux, and have soared to new heights, experimenting with graceful forms, durable glass and the creative process to give rise to new works.